I have finally done what I have talked about doing(and then almost always completely forgotten about until it's too late) for about 3 years now, that is I registered and made a team for the March of Dimes March for Babies walk! Every day, thousands of babies are born too soon, too small and often very sick. 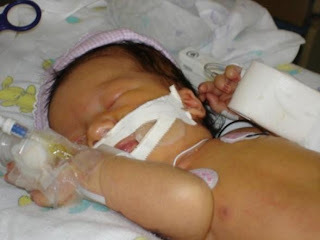 Our team is walking in March for Babies because we want to do something about this. I know you care, too. That's why I'm asking you to join us. If you can't walk with us, please help by donating to our team. You can do so right on this page. Thank you for helping us give all babies a healthy start! The mission of March of Dimes is to improve the health of babies by preventing birth defects, premature birth and infant mortality. Funds raised in March for Babies support research and programs that help moms have full-term pregnancies and babies begin healthy lives. And they will be used to bring comfort and information to families with a baby in newborn intensive care. Thanks! Hope to see you then!! SO, I am not sure how much of Ava's palate "issues" I have actually gone over and covered for everyone, and especially on this blog. So I suppose I should start at the beginning. We first saw milk come out of Ava's nose the very first time she ate, only hours old. It happened while eating, as well as afterwards, if she spit up half of it would expel via nose. We mentioned it to the nurses who passed it along to dr's. They would take a quick peek down her throat and in her nose, note that there was no cleft or severe palate issues, and leave it at that. "I cannot see or feel any abnormalities" couldn't even begin to tell you how many times we have heard this. Right. So every baby spits up through their nostrils? Didn't think so. We didn't push it nearly as much as we should have, though. We took their word and did the "wait for her to grow and watch to see if it's something she "grows out of" game. Though we did continue to bring it up, only to be met with the answer of, "well I see it noted that no cleft or abnormal palate was noted on observation". Fast forward to a few weeks ago, at Ava's private speech evaluation with a wonderful therapist Ava saw before she went into the Alta program. This was no typical, 15minute, let's hurry up and get this over with(how it often seems) evaluation. This Speech Therapist really took to actually evaluating Ava and noticed a few things that sent up immediate red flags. She asked me a few questions and continued playing with Ava. Then she asked if it was okay to look into Ava's mouth to check out her palate. Ava was very willing(she trusts her therapist) and after a somewhat lengthy look around, she said while she is absolutely not a doctor or specialist in this field, she is noticing some abnormalities going on in there. We discussed what they could be, what it would mean, what her part in everything would be, how I should approach this, etc. She was so very helpful. Someone was finally listening to our concerns and validating them. She offered to send in her findings once we got the referral for ENT. Fast forward to today, the day of Ava's appt with ENT. We also decided since the school was unsuccessful in getting Ava to participate in a hearing test(go figure, typical Ava) that we would go ahead and try a hearing test there. So we got that all set up, and went over a few questions and concerns, mostly about her ears. We mentioned the palate so he does the usual look and feel, says everything feels and looks fine and continues on about the ears. Frustration. I am so absolutely frustrated at this point. I mean I specifically tell this specialist that my almost four year old cannot blow a bubble or make certain sounds, that it is PHYSICALLY impossible for her, and that liquids STILL come out of her nose when she drinks. And he just more or less brushes it off again. I tried to calmly state that this needs to be further evaluated because there is obviously SOMETHING going on. And that her speech therapist didn't just look, she had Ava talk and make certain sounds while looking to see how the palate was moving, and that she absolutely saw something ABNORMAL going on. What she thought it was wasn't necessarily important, but she even allowed me to look in both her mouth while making an "aaaahhhh" sound and then in Ava's mouth while Ava made the same sound and I could clearly see discrepancies. So I wasn't leaving that office again without a better answer/solution. Only then does he mention that we will have to get another referral to an actual speech pathologist or craniofacial specialist. And that they would basically further investigate what could be going on. I understand that we are her parents, we are her advocates, etc. But what happened to doctors who go above and beyond. Or those who just actually do their jobs and continue investigating until the "problem" is solved, or in the very least addressed?! I honestly just do not understand. So now we sit and wait to hear back about the new referral. Which isn't going to be the easiest to get because there are no specialists in our "group" they are all at Sutter and UCD. Which means we will undoubtedly be referred to a UCD doc. Ah yes. The trip I have been mentally planning since our last trip with Gregory when he was about 5, finally happened. We booked our 5 night, 6 day, 5day hopper pass trip to Disneyland via Costco Travel. We stayed at the Hyatt OC, which is where we had previously stayed and fell in love with. And NO it wasn't JUST because they have a Starbucks in their lobby, though that was definitely a perk. :) I have to say, I thoroughly enjoyed my booking experience with Costco Travel. They offer fantastic rates, and include lots of great and fun extras. Such as a Character Dining Experience for each staying guest(we chose the princess experience at Ariel's Grotto for Ava since Greg REALLY didn't have a preference and said as long as food is involved he is down, what a good big brother! ;), travel tags, lanyards, pins, a $20 Disneyland gift card(yeah it pretty much bought the equivalent of a pack of gum and a drink) extra hours in the park, preferred seating for shows, etc. So we were set to leave for Anaheim on Monday, February 15th. On Sunday, the 14th, Husband surprised us by announcing we would be leaving a day early, HOORAY! 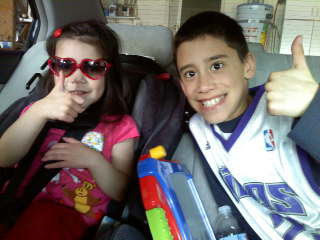 So we quickly got the kids situated and packed up and we were on our way! We arrived pretty late that evening, and decided to just take it easy so we could wake up early and ready to go the next day. The kids did really really well on the car ride. 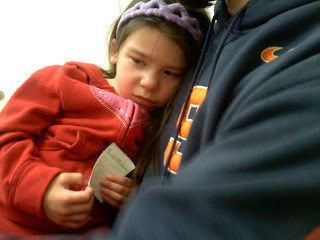 Ava luckily slept most of the second half, if not more, and Greg had his lifesaving Nintendo DS to keep him occupied. Day two was filled with rides, rides, food, playhouse Disney live shows, souvenirs bugs life shows, rides, food, parades, and more rides. FUN! We definitely brought back two VERY tired, very HAPPY kiddos to the hotel room that night. So the next day we made it more about G, as much as we could. While him and bigger G went on Space Mountain, and all those other rides, I took Ava to meet Tinkerbell and Silvermist. We waited in a line that took over an hour and a half to get through. To meet two characters. Yup. I think that was definitely the final nail in the nutjob coffin. Oh well. Ava was again, beside herself happy to be meeting TINK and the "blue fairy" they signed her autograph book, talked to Ava about her favorite color(she was head to toe pink but insisted her favorite color was "purplicious") and Tinkerbell even insisted on dancing with Miss Ava once she saw Ava's cute princess ballerina tutu(purchased from that previously mentioned evil store that is chocked full of the cutest princess stuff EVER). It was the cutest thing ever to witness, and the big smiles during and after made standing in line, in the hot sun, totally worth it! Later that night, after the parade, we wandered over to Downtown Disney with the sole purpose of taking G out to dinner at the ESPN Zone. Well...turns out that's another place you really should make reservations for. 75minute wait for dinner and it's already 8pm?? No, thanks. Gregory was pretty happy just browsing the store, picking out an ESPN shirt and game, and calling it a night, though. So we went back to the hotel and ordered in. Friday we got to the park early, and headed straight to Toontown. Ava saw Mickey and Minnie's houses and was STOKED to meet them...thank GOODNESS. So we stood in really short almost nonexistant lines and took pictures with each character, let G chose if he wanted to partake and walked through toontown a little bit more. Then took each kiddo on a couple of rides until it was time for lunch! Which we had at the super yummy restaurant that is inside the pirates ride, Blue Bayou. Oh, it was SOO good. After that, we just let the kiddos do whatever rides they wanted to do, as many times as they wanted to do them. The trip was fantastic. The kids both had a wonderful time. And we were EXHAUSTED. But in a good way. I am just super thankful that we are able to take a trip now with Ava and not have to worry about as much as we used to. 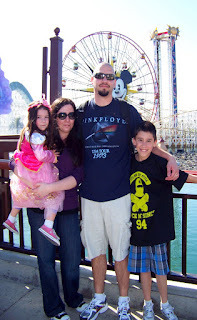 In fact, this was our first real trip besides to San Francisco, that we have all gone on together since Ava's birth. Greg was worried in the days before the trip that there wouldn't be much for him to do at Disneyland, but he quickly found out that there was still PLENTY that held his interest!Plus, he was a tremendous help with his little sissy. He never once complained if he had to accompany Ava on to a couple of her rides because she would request for brother to go with her, or when we went to the princess lunch. Ava overcame her fear of people in big costumes(hooray!) and had the time of her life, one she still talks about and reinacts with her dolls and any willing and able body. :) We owe our amazing time to the guy who works his booty off to provide for his family and never, ever complains about it. I married one incredible guy, and the best father around! Thanks hubby, we love you so much! !